One of my all time favorite baseball players is Larry Walker. I am a die-hard Dodgers fan and he has been a rival player but never was Dodger, despite my disappointment. So how did a guy that made his name as a player for a division rival become one of my favorite players. Well the Youtube clip below is the exact moment he became my favorite player. The clip shows him forgetting the outs and giving the ball to a fan when it was in play. The cherry on top is when he ask for the ball back. This happened at Dodger Stadium. I was in grade school at the time and wished that kid was me. What the clip doesn’t show is that he came back before the next inning and gave the kid a ball. It feels like just yesterday when that game was on. I have to be honest, before Larry Walker may have been a division rival but I liked him before that when he was with the Expos. I mean how can any fan hate any Expo? 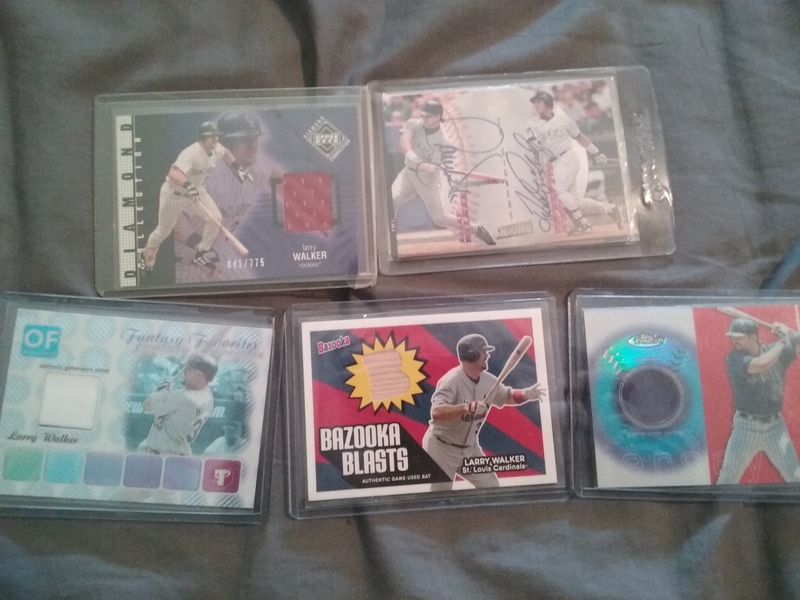 When I got back into collecting and discovered that game used cards existed, I spent a lot of money accumulating his cards. My personal collection is only 10 to 20 deep but as a small time collector, that is a lot. To put that in perspective, there is only one former Dodger who I even have half as many cards of. It was awfully tough to track down his autograph at a price that I could afford, but I finally did. It is a dual autograph with Andres Galarraga-another former Expo turned Rockie.